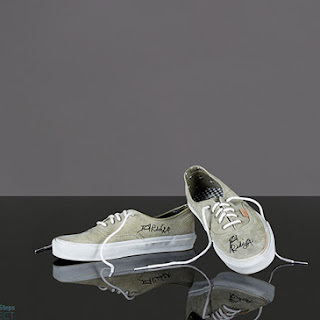 Daniel Radcliffe has again donated and signed shoes for Small Steps Project's London Celebrity Shoe auction. The charity raises money to provide thousands of shoes, clothes, food and aid to barefoot children scavenging for survival on landfill sites around the world. Update: 30th November 2015. The auction has ended. With a total of 60 bids the shoes are sold for £497.23. This year he donated his grey Vans sneakers with white laces in size 8 (size 42 in Europe). The Auction goes live tonight, 7pm GMT: 24th-29th November. When the eBay link is online I'll add it here. Here's the eBay link. With thanks to Small Steps Project for sending the info.